On Riverside there’s not much room now between trucks and cars and and the edge of the road. Linn County’s long-awaited widening of 2.4 miles of Riverside Drive will have to wait until next spring. But then it will be completed by June 22. I learned this Monday when I checked with County Engineer Chuck Knoll. He told me that as expected, the contract to widen Riverside from Oakville Road to Meadow Road was awarded to Knife River in Tangent, whch had submitted the lowest of seven bids at slightly more than $1.9 million. The county had expected that some of the work under the contract would be done this fall. But Knoll says it was Knife River’s decision to postpone the start until March or early April, and then go full bore in order to finish the widening and repaving by June 22, which is the completion date specified in its contract. The widening will result in two 12-foot travel lanes and 4-foot shoulders. As it is now, the shoulders in some spot are a foot wide or less. The widening is expected to help keep bicyclists out of the way of motor traffic. 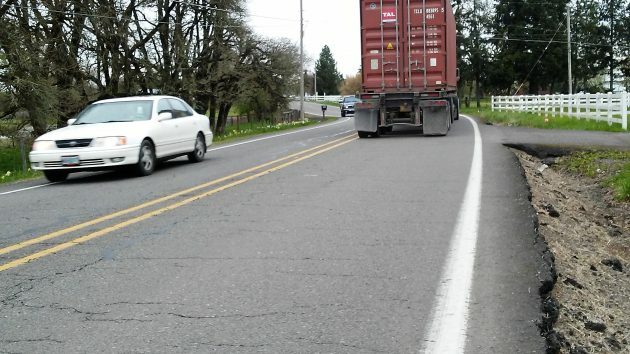 The county’s plan to widen Riverside, making it safer for cyclists and motorists both, was an element in ODOT’s decision to build a bikeway from Corvallis to Riverside on the north side of Highway 34. That path was completed in late 2015.
is this ODOT throwing a bone to the Liberal Bicycle Association? This is a Linn County project, paid from the county road fund. No ODOT involvement, throwing a bone or otherwise. Bike riders pedal in all flavors. Left, Right, Alt-Right, Wrong. Others in the rainbow flag. Gasp! Bicycles are popular so probability says some even voted for 45. Now there is a gasp.